The Lawyers Professional Responsibility Board is investigating another complaint against Supreme Court candidate Michelle MacDonald. The latest complaint was filed by blogger Michael Brodkorb and his co-author, Allison Mann. MacDonald is suing the writers for defamation. The LPRB complaint is the second to be accepted in recent years. In January 2018, she was disciplined after the state Supreme Court upheld most of a referee’s findings following the previous board investigation, which began in 2016. Brodkorb and Mann filed their complaint earlier this summer. It charges MacDonald with committing three violations of the Minnesota Rules of Professional Conduct while bringing her defamation case against them. Both connect to MacDonald’s legal representation of Sandra Grazzini-Rucki, who was convicted in 2016 for interfering with her ex-husband’s parental rights. 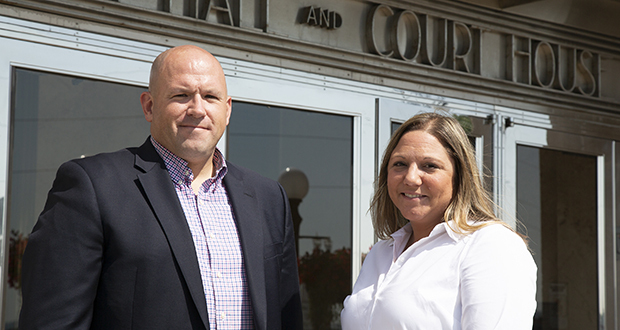 The first complaint stemmed from conflicts MacDonald had with 1st Judicial District Court Judge David Knutson, who presided over a family-law case involving MacDonald’s client Grazzini-Rucki and her ex-husband, David. MacDonald was jailed overnight for taking photos in court during one of those hearings. MacDonald eventually filed a $330 million federal civil rights lawsuit against Knutson; that case was dismissed. She also filed complaints against Knutson with the Board on Judicial Standards. In 2016, Knutson complained about MacDonald to the Lawyers Professional Responsibility Board. It investigated and in January 2018, the Supreme Court granted its recommendation to suspend her from practicing law for 60 days. The court also placed MacDonald on supervised probation for two years. A third recommendation, that MacDonald undergo a mental health exam, was rejected. Supreme Court Justice Anne McKeig disagreed, contending that MacDonald should have been suspended for six months and taken a pysch exam. MacDonald appealed the decision all the way to the U.S. Supreme Court, which denied her petition on June 25. On June 5, MacDonald filed as a state Supreme Court candidate for the third time, challenging incumbent Justice Margaret Chutich. Brodkorb and Mann, co-authors of the MissingInMinnesota.com website that covers the Grazzini-Rucki case, filed their LPRB complaint in June after MacDonald sued them for defamation. Susan Humiston, the board’s director, confirmed for Minnesota Lawyer in late August that the complaint is being investigated, but had no further comment. The board informed the parties of its decision on June 28. Engh said that part of Brodkorb’s complaint—the filing of two suits separately in Ramsey and Dakota counties—was meritless. The double-filing resulted from a “clerical error at best,” Engh wrote. On Aug. 20, District Court Judge Karen Asphaug granted MacDonald’s motion to dismiss the Dakota County case. It will proceed instead in Ramsey County. On Aug. 25, Brodkorb and Mann responded with their own letter to the board. “The complaint is based on a concern that the continued ability of Michelle MacDonald to practice law in the state of Minnesota is a detriment and danger to the public,” it says. The complaint’s “general basis,” the two contend, is that MacDonald might be disobeying the Supreme Court’s order by practicing law solo while on probation. It also contends that MacDonald intentionally made a false report of “criminal defamation” against Brodkorb in Eagan. According to a police report filed earlier this year, MacDonald told an Eagan officer that Brodkorb took a photo of her, altered it and uploaded it to a public mugshot web page. Then he downloaded the photo and posted it to his own blog to falsely present it falsely appear to be as a booking photo, according to the police report. Dakota County officials confirmed for Minnesota Lawyer that the picture was a booking photo taken the day she got arrested for taking pictures in Knutson’s courtroom. The “false image” is one defamation claim in MacDonald’s lawsuit. Another is the bloggers’ allegedly false description of MacDonald a “person of interest” in the 2013 disappearance of the Grazzini-Rucki’s two young daughters. Minnesota Lawyer confirmed with police that MacDonald initially was considered a person of interest in that case. Brodkorb and Mann’s LPRB complaint accuses MacDonald of three professional-conduct rules violations. Rule 3.4: Fairness to opposing party and counsel: The writers allege that MacDonald violated Rule 3.4 when she “falsified evidence” by filing the Eagan police report against Brodkorb. Rule 3.1: Meritorious claims and contentions. The writers claim MacDonald acted as her own attorney while drafting her “frivolous lawsuit.” If true, that could violate the Supreme Court order. MacDonald’s June 14 defamation complaint was signed by herself and attorney Larry Frost, who is identified as her supervising attorney. In an Aug. 24 interview, however, Brodkorb said he thinks MacDonald drafted the complaint alone. A responsible attorney would not have allowed a court filing containing so many easily refutable claims to be filed, he said. Reached Wednesday, however, Frost said he investigated the suit’s three main charges. But he did not check her contentions against police records or perform a forensic examination of the disputed mugshot to see if it was digitally altered, he said. “I went through what I thought was a reasonable level of checking of her contentions when she filed this thing,” Frost said. Both Frost and the LPRB confirm that Frost remains MacDonald’s supervising attorney. But he said he won’t sign further filings connected to the defamation suit, because he expects there will be no more filings. The MNCIS court database lists attorney Karlowba R. Adams Powell as MacDonald’s lawyer in her Ramsey County defamation suit. Oddly, Adams is herself serving a court-imposed two-year probation that prohibits her from acting as a lawyer unsupervised, according to court records. Powell could not be reached for comment Wednesday. Rule 8.4: Misconduct. The first two violations constitute misconduct under the state’s attorney conduct rules, the writers assert in their response letter. MacDonald’s defamation suit is scheduled for a hearing in Ramsey County District Court on Sept. 10, in the courtroom of Judge Richard H. Kyle.